This topic has been more requested than any that we have previously written about, for it catalogs the most potent of the pain-relieving herbs which are still legal at most locations. The information about these natural medicines has been sparsely distributed, but there is an underground movement of freedom fighters who are beginning to share it. This article is an attempt to unify this critically important information, and to make it easily accessible for those needing serious pain relief. We have personally tested some of these natural medicines ourselves, and we encourage our readers to not underestimate their power, or experiment with massive doses. They are strong medicines, and they should be wisely treated with that degree of respect. Consider the sap from opium poppy flowers as an example, for it was first used to make opiates, and then it was further chemically refined to make codeine, morphine, and Heroin too. This simple plant is still the foundation of all pharmaceutical painkillers in one way or another. We must not continue without an obligatory notice about caution. It is foolish to use any painkiller (natural or pharmaceutical) to merely mask pain instead of remedying its cause. Routinely doing so will lead to more suffering later, when more symptoms arise from the systemic problem that was ignored. Pain always indicates that something is wrong, so efforts should be made to uncover the cause and correct it. Therefore, painkillers should only be used to temporarily mitigate a patient’s suffering, while simultaneous efforts are made to eliminate the health issues that are causing pain. There is a solution for every disease state, even when doctors swear to us that it would be impossible for us to heal, as so many of them seem to love to state. Most people are chronically diseased for most of their lives because of the lies, for they place an absolute faith in a system that is working against God’s commands with new age sorcery that is paraded to be scientific. Our dozens of plagues are the wrath of God unfolding before us, but our corrupt society is too arrogant to believe it, but never before has any war in the world’s history had the level of carnage that our ‘medicine’ is accruing yearly, and the mortality statistics clearly show this to be true. Take the pharmaceutical painkillers for making a point about how wicked and dishonest the system is. Its pain-relieving drugs are chemically engineered to create a tolerance, so increasing doses are always needed over time, as they eventually damage the liver (and other organs) to conveniently require more drugs indefinitely, and they are extremely addictive in order to ensure that victims can never free themselves. The slave masters of the past never had it this good or profitable. Meanwhile, this same industry coordinates with governments to suppress information about the organic plants that work without problems, as these plants have safely done for humanity for thousands of years, and then they outright ban the plants whenever the information can no longer be sufficiently suppressed. Good examples are the coca (cocaine) plant, the opium poppy, and of course, cannabis (marijuana). For there to be real hope of future liberty and chances to truly heal ourselves, then we must never allow it to happen again. Christians should be especially appalled by the lies, and the establishment’s attempts at taking away the natural medicines that God provided for us, in order to force their faithless sorcery upon us. When our only options are to obey or suffer torturous pain, then it is clear that they are not really the good guys, and they are not really serving our interests. Kratom is used for severe pain, such as the pain that results from car accidents and botched surgeries. It is a very strong and capable painkiller, often replacing oxycodone (Oxycontin) and hydrocodone (Vicodin). It typically causes a feeling of euphoria, relaxation, and a bizarre tingling sensation in the frontal lobes. The tingling is usually brief. Kratom is also used for reducing addictions to the pharmaceutical derivatives of opium. Such addicts can use kratom instead of the addictive drugs to curb their withdrawals. After an extended period of this therapy, addicts can stop taking kratom without incident. Our own experimentation with kratom has shown that it has a tendency to cause a user to serenely reflect upon his past experiences, including unpleasant experiences that would otherwise produce a traumatic effect. Therefore, it shows great promise for psychiatric use, in a very similar manner to the drug Ecstacy (3,4-methylenedioxy-methamphetamine). There are three varieties of kratom, and each has different properties. Although, all of the strains provide some pain relief. Red vein kratom is the strongest variety for pain relief. It is also helpful for reducing stress and anxiety. Its mental effects are similar to cannabis (marijuana) in that it tends to make people much more relaxed and less worried. In other words, everything just feels right with the world, so contentment comes easy. This emotional affect helps in making it best for those in severe pain, because severely injured people should limit their activities, so that they can heal. Like cannabis, it may also cause a slight hunger whenever it activates. This phenomenon is commonly referred to by cannabis users as “the munchies”, but it is much less intense with kratom. 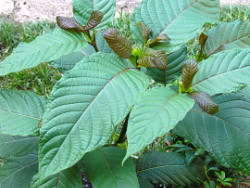 This variety is often sold as “Red Thai Kratom” or “Bali Kratom”. White vein kratom is a stimulant, though it is different from pharmaceutical stimulants in that it tends to increase a person’s drive, and his desire to accomplish; rather than just providing raw energy. This herb would be an ideal aid for someone with attention deficit disorder, or anyone with energy and concentration problems. It is like an all-natural Ritalin. In this regard, it could be considered the opposite of the red vein kratom. Some people use white vein kratom in a tea, instead of having morning coffee. Although, it is alleged to have a disagreeable flavor. White vein kratom is often sold as “Maeng Da”. Green vein kratom effects and affects its users like a blend of the other two strains, which is milder than either. It is a decent, general purpose pain reliever, and it provides some extra energy, but it does not provide the same motivational factor as the white vein kratom, nor does it blunt pain as effectively as the red vein type. It is frequently sold as “Green malay kratom”. For most people, the ideal kratom dosage is between 1 and 2 grams. However, starting at 0.5 grams is wise, because this is plenty for some people, especially those of lower body weights. Kratom capsules typically contain 0.5 grams each. Those who are using kratom for opiate addictions will need to use higher doses to offset their cravings. Some experimentation will be needed. Kratom must be swallowed to be effective. Smoking it provides no benefit. There will be variances in both the effect and the time that it takes to become active, because it is a natural herb that cannot be chemically standardized. In an empty stomach, its effects may begin within 10 minutes, but the time will be an hour in some cases. Once active, kratom has a very persistent effect that can last for 24 hours, or even more. High doses can cause nausea, which generally only happens to those who have taken extreme amounts to get “high”. Opium lettuce grows throughout the world in various backyards and near roadsides. It loves to grow near asphalt. 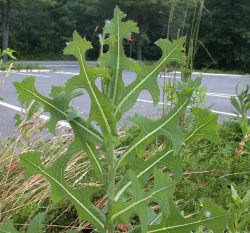 The plant is usually considered to be an invasive weed, and it certainly is the ugliest of the plants mentioned herein. When its leaves are scored, they release a milky sap. This sap mimics opium, hence its common name, “wild opium lettuce” or simply “opium lettuce”. The plant’s leaves are broken from the plant and scratched to release the sap, and then it is collected. It is a type of natural latex which is typically formed into pill-like balls. These can be directly consumed as pills, or smoked inside of a pipe. Opium lettuce is often reported to cause a numbing sensation that is felt spreading throughout the body. This feeling is particularly noticeable when the lettuce is smoked. It does not usually impart a euphoric or a “high” feeling. There are few studies of opium lettuce in the Western world, but researchers in Iran have confirmed that opium lettuce was well known as a painkiller and sedative before the Victorian period. Thus, it is likely that it has been used for eons. In the paper, Lettuce, lactuca sp. as a Medicinal Plant in Polish Publications of the 19th Century, the Institute for the History of Science affirmed, “The action of the substance was weaker than that of opium, but free of the side-effects, and medical practice showed that in some cases lactucarium produced better curative effects than opium”. Despite opium lettuce not containing opium, it has multiple characteristics that are similar to it. In addition to its pain-relieving properties, it is also known for assisting with coughs. It has even been used successfully in the mitigation of whooping cough (pertussis) symptoms. The Servall Company published a catalog of medicinal plants in 1917, which was entitled Health from Field and Forest. It stated that opium lettuce was “highly esteemed to quiet coughing and allay nervous irritation, a good safe remedy to produce sleep, to be used when opium and other narcotics are objectionable”. When it was written, codeine and opium were still widely available without a prescription. Both were considered to be safe and effective medicines, yet opium lettuce was known to be even safer. Eating large doses of opium lettuce can cause nausea, vomiting, anxiety, and dizziness. So, it is probably best not to use it in a salad. The powdered leaves lack most of the effects of the sap, though the powder has a historyof being used to remedy sunburns. Approximately 1.5 grams of opium lettuce sap is typically infused in a tea. It is alleged to have a sweet taste. Only about 0.25 grams are smoked in a pipe. It is considerably more potent when smoked. This flower can be used by both men and women as an aphrodisiac. It is a painkiller that is especially useful for relieving muscle spasms, migraines, and tinnitus (ringing in the ears). It can be smoked, which is especially beneficial for eliminating migraine headaches, since they usually accompany nausea. Blue lotus is reported to be “not as strong as codeine”, but it is effective in remedying migraines, menstrual cramps, and various moderate pains. While it is weaker as a painkiller than the other herbs within this article, amongst the things that it does do, it does them best. Those who are researching this plant should be aware that it is commonly confused with the lotus (Nelumbo nucifera), but in fact, the “blue lotus” is a water lily. There are no blue members of the lotus family of plants. 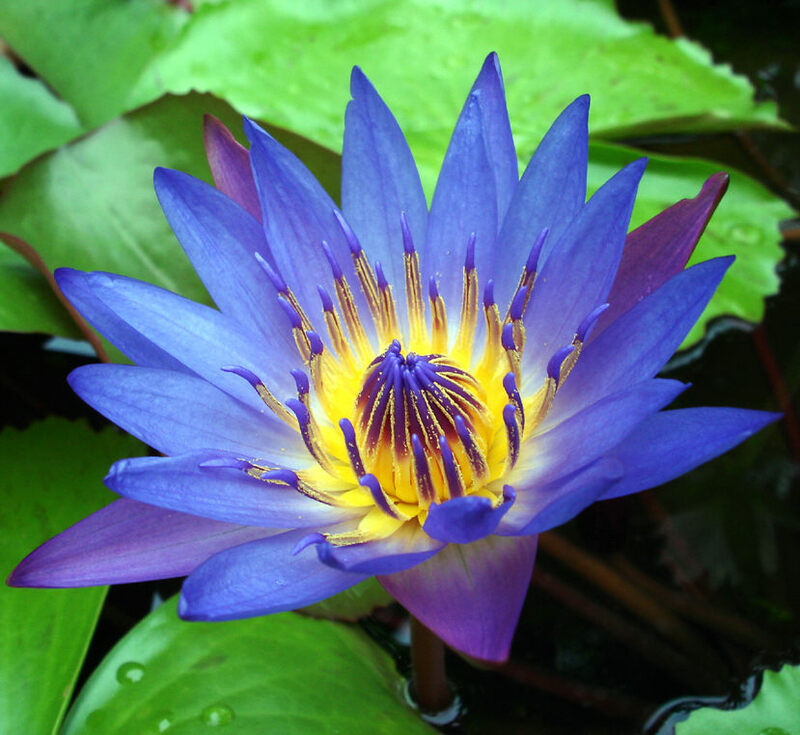 Blue lotus flowers are often used to make teas, wines, and martinis. The effects of the plant are amplified whenever it is combined with alcohol. There is very little of a mental effect from it, though it can produce a feeling of relaxation in high amounts. In large doses, it can produce a slight “high” feeling that is allegedly similar to that of cannabis. However, extreme dosages should not be necessary for medicinal use. Typical recipes involve soaking 10-20 grams of petals for up to three weeks in an alcohol solution. Blue lotus tea is prepared by boiling the flowers (the petals and flower heads) for 10-20 minutes. When it is smoked, the petals and the flower heads are combined inside a pipe. Kava kava (frequently referred to as just “kava”) is used to relieve anxiety, and to remedy the pain of sore muscles. It appears to have an ability to relax the muscles throughout the body. It imparts a euphoric state when it is consumed in large amounts. The euphoric feeling that is produced by kava has often been compared to alcoholic drunkenness. There are a few rumors of it having caused hallucinations on the Internet, though they all appear to have occurred from the use of strange mixes that contained chemicals. It is known to be especially helpful for tension headache relief. Kava kava contains an anti-spasmotic called nuciferine, so it might be useful for bothepilepsy and A.D.D. Note that attention deficit disorder is in part a seizure disorder, but this has been whitewashed by the psychiatric establishment throughout the last decade. The University of Minnesota found that kava “prevented the formation of 99 percent of tumors in a mouse lung tumorigenesis model that is routinely used in predicting lung cancer behavior in humans”. In the same study, DNA damage resulting from cigarette carcinogens was reduced significantly with kava kava supplementation. Researchers noticed that despite similar smoking rates, the lung cancer rate in Fiji, where kava tea is a staple beverage, is approximately 1/20th of the rate for American smokers. Thus, we recommend it for everyone who smokes, alongside regular supplementation with L-taurine, and the use of self-rolled, organic cigarettes to prevent lung cancers. The typical amount used in tea is about 3-5 flowers, which is about 5 grams. It may be drank in a tea form, or put into capsules and swallowed, or even smoked. The amount used for smoking varies greatly. The dosage weights that are provided in this report are much smaller than what can be calculated by a normal scale. Scales that are designed for such small weights can be found in legal high stores (“head shops”) and online. The typical cost is about $10.00 (U.S.D.). The type of scale needed is called a pocket scale. All the painkillers cited can be grown or purchased. For immediate help, these herbs are often found in local “legal high” stores, which are also called “head shops”. These medicines tend to be very cheap, and yet very potent. Americans have the best chance of getting natural painkillers if they order from domestic sellers, since this will prevent the F.D.A. from intercepting the medicines at the border. Purchasing them online will almost certainly require using a credit card other than Mastercard. It is always best to keep painkillers available for whenever an accident occurs. Thus, purchasing beforehand is a wise decision, especially since some of these will likely need to be ordered online. Furthermore, the legality of these herbs may change rapidly, so ordering plenty would be a worthwhile investment. Kratom is natively grown in Thailand, and it can be grown in warmer climates. It has been successfully grown in Florida, Hawaii, and parts of California. However, those in colder regions have had success with growing kratom indoors, near a window. Growing it indoors is problematic, because kratom is a tree that eventually grows to become quite large if it is not pruned regularly. Never use any fertilizer on kratom, except for natural manure. Chemical fertilizers always kill it. It is a mystery as to why this happens. Opium lettuce grows like a weed. It does not need much care, and it will even die if pampered. 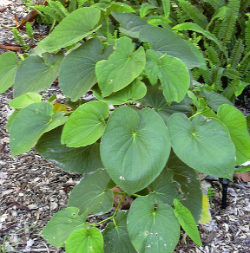 It likes shade, and it does not like for soil to be too moist. Once cultivated outdoors, the plant should spread literally like a weed, so that opium lettuce plants will be found throughout the area. One only needs to loosen the soil, sprinkle the seeds atop the soil, and keep the soil slightly moist. Given that blue lotus is a water lily, a pond is needed to grow them. However, the plants are usually sprouted indoors. To do so, add a layer of soil to the bottom of a small pot or pan, then fill to the brim with warm water. Once the soil has settled, attempt to level and compact it. Sprinkle the seeds as evenly as possible, and add a thin layer of white sand on top of the seeds. This helps to anchor them. Adding water after adding the seeds will bury them, and prevent them from growing. When leaves appear from the seeds, the baby plants can be gently moved to a permanent home, such as an outdoor pond. Kava kava grows in tropical climates, and it favors Hawaii. It can be grown in cooler climates if it is taken indoors during the colder months, though it will need to be pruned to keep it manageable. It takes at least four years for kava kava to reach maturity. At four years of age, the lateral roots are then collected. These roots grow just under the surface of the earth. The plant will die if the roots are collected early, and the roots will not contain the active constituents. The existing research of kratom shows a fixation on the topics of whether kratom can induce addictions or cause harm, because all of the studies originate from the industry that is threatened by natural alternatives. In fact, most of the studies actually admit from the very beginning that they are searching for unflattering results, even before any testing is done. We have not found a single study that was objectively searching for the true effects of using kratom, or one that was searching for benefits. Most studies have concluded that kratom must be addictive, based on the gratuitous assertion that it effects the same area of the brain that painkilling drugs do. This is religiously recited throughout the studies, despite the fact that kratom usage tests have never shown any withdrawal symptoms whatsoever. Yet they do not appear to be getting discouraged. Withdrawal symptoms were only observed in subjects who were using kratom to eliminate existing addictions that had been previously gained from pharmaceutical-style opiates. It means that the addictions that the system is blaming on kratom were actually from the system’s own line of drugs. To make a long story short, the usual pattern was that subjects were specifically chosen for having pharmaceutical addictions, and then they were given kratom so that it could be falsely linked to the existing drug withdrawals. It is the sort of scientific slight-of-hand that our research has accustomed us to. Whenever studies are manipulated to accomplish an agenda, then it is a perversion of science, of which we are prone to calling dirty politics. To make the point about the politics that is involved, they are still trying to find a harmful effect for cannabis (marijuana), and they have not been able to document a single individual who has been harmed. They certainly scare us by decrying that the natural medicine might do this or that thing, but can they show us an actual individual with a verifiable injury in recorded history? Where are those millions of people who have been horribly hurt by “marijuana”, if we do not count the ones whom the establishment has hurt and then imprisoned? Where did the victims disappear to? How many poor souls inside of the emergency wards are there because “pot” did them in, and how many are there because of the effects of “safe” pharmaceuticals? The only verifiable findings about cannabis’ overall health impact are that it is an anti-carcinogen, it improves lung capacity, and it boosts oxygen intake into the long term. Most people could easily learn to live with these things. The U.S. Drug Enforcement Agency (D.E.A.) has described kratom as a “drug of concern”, and pointed to a possible death to justify its aggressive posturing. Of course, kratom is not a “drug”, but getting it considered to be a drug is another slight-of-hand trick to manipulate the public into giving them the power to take away more of our freedom. In the case cited by the D.E.A., a coroner attributed a man’s death to “possible Kratom toxicity”, despite the man’s history of Heroin abuse, and despite the fact that both a cold medicine and benzodiazepines were found in his body at the time of his death. Benzodiazepines are a family of tranquilizers, which includes Xanax and Valium. Xanax caused more than 150,000 emergency room visits in 2009 alone. Even if it were true that kratom had led to the death of this one individual, it could not compare with the 16,000 deaths that occur every year from what are considered to be the safest pharmaceuticals of all: Tylenol and aspirin. Unlike kratom,Tylenol weakens the liver, and it can become a fatal poison whenever it is mixed with alcohol. The manufacturer leaves this pesky tidbit off of the labels, by the way. The Tylenol danger is one of the real reasons why so many “binge drinkers” die every year on college campuses, but we are not told the truth, because it would be bad for business. Pharmaceutical Tylenol (acetaminophen) has yet to be listed as a “drug of concern”, despite its issues and the fact that it actually is a drug. Considering the number of places in America that are now legalizing cannabis, Americans are simply not believing the lies anymore. They have begun to realize that there is an agenda to take away their freedoms for the sake of corporate and governmental interests. They are awaking to realize that it is not really that weed in the backyard which they should fear, but those who relish busting down our doors in the middle of night, shooting our pets, and shoving machine guns in our children’s faces to supposedly protect us from ourselves. Kava is already illegal in Australia, Canada, South Africa, and the United Kingdom. The strained justification was that some unethical suppliers were creating extracts from the plants using dangerous solvents. These poisoned products caused liver damage, and this was blamed upon the kava, as expected. Like the other natural medicines mentioned herein, organic kava has no known cases of causing harm. Nonetheless, the psychiatric industry, acting alongside its governmental cronies, got an excuse to ban it, and they did it in multiple countries. Like is the case for the other natural medicines mentioned, their real reason for the ban (the one that they never mention to the public) is because it is truly safe, effective, cheap, easily accessible, and non-addictive. This combination makes it a threat to the agenda and business. The medical establishment does not want regular citizens to have access to safe and effective painkillers, because pain is the thing guaranteeing that the public will fall back to the system. Eventually, everyone gets injured in a way that requires pain relief. It is these instances which force even the most educated citizens to return to allopathic medicine for relief. If citizens had access to better and cheaper pain relievers that were outside of the system, then people could become completely independent and free. Prior to the last century, herbalists successfully competed with allopathic doctors, and the herbalists generally had much better results. This was largely due to the herbalists’ easy access to painkillers like opium and cannabis. These plants were also core medicines of the establishment as well, which had been doing poorly in the free and open medical market. The free market allowed people to choose their medicines based upon their true merits instead of being controlled by legal requirements and regulations. Thus, medicine was not our biggest killer in those days. It was the U.S. federal regulations combined with state licensure laws and forced changes in the university system that finally ended the competition worldwide, as has been shamelessly boasted about in public documents from the American Medical Association. Strong pharmaceutical pain relievers are now only available by way of an official prescription. Most of these drugs are categorized as “controlled substances”, which means that individuals can be criminally charged for just possessing them without permission. A free people never needs permission to take care of their pain, and free people are not required to officially report about it, replete with identity documents. The first thing asked is always something like, “Your papers please”. At this time, doctors resist providing prescriptions for painkillers, due to their buying into the hysteria about painkiller addictions. Of course, some of the hysteria is merited, but all of it is by design to ensure that the patients literally keep coming back and begging for more. Thus, there are thousands of suffering people who are living in constant pain, who risk being made into felony criminals for just seeking alternative access to prescription-only pharmaceuticals through unlicensed drug dealers. It is why so many desperate people are discreetly ordering pharmaceuticals from other countries, such as Canada, because the U.S. system otherwise requires them to live in a personal, never-ending hell without help, or it would simply destroy them financially. In the U.S., the F.D.A. has been leading the charge to take painkillers away from the people for over a century. None of the natural painkillers that are cataloged in this report are illegal in the United States, but the F.D.A. has been illegally abusing its power to prevent people from getting access to these herbs. The Federal Food, Drug, and Cosmetic Act of 1994 gave the F.D.A. the power to intervene whenever a seller of a product makes “claims” that his product is helpful for treating or curing any disease without official permission. Telling the truth about a competing medicine actually requires official permission from the F.D.A., which has never been given for anything. Moreover, pain is not a disease, so the F.D.A. has been flagrantly violating the law by arbitrarily seizing pain relievers. On September 25th of 2014, the F.D.A. seized 25,000 pounds of kratom from Rosefield Management in California, whilst claiming that it was because kratom is an “unapproved drug”. For maximum intimidation, the F.D.A. sent armed Federal Marshals to perform the raid. Kratom is a plant. It is not a drug any more than a carrot is a horse. Following their usual modus operandi, they justified their criminal activity by stating that the seller’s truthful claims about kratom’s ability to greatly reduce pain and alleviate opiate addictions had somehow meant that it had been transformed into a drug, as if the seller’s claims had some type of magical power. Even if that could be true, it does not account for the fact that neither pain nor addiction are diseases. However you examine the situation, they have been ignoring the law and making their own as they have seen fit. Such behavior is the hallmark of tyranny. On November 7th of 2014, the F.D.A. issued an import alert on kratom, which effectively means that the F.D.A is attempting to seize all of the kratom that enters into the U.S.A. Kratom is not illegal at the federal level, nor is it illegal in the vast majority of states. When it issued its import alert, the F.D.A. claimed that kratom is a hallucinogen, which was a lie. Even if it were actually a hallucinogen, it would still not give them the authority to simply take whatever they want, whenever they want, in punitively stealing from the lawful citizens of whom they pretend to serve. This is the behavior of the Mafia, but not of an accountable regulatory agency. By confiscating kratom as it is being imported, in utter disregard of our laws, the F.D.A. is willfully sabotaging the basic human right of the people to heal themselves through God’s natural medicine and our right to trade legal goods. The reason why they are dishonestly claiming that kratom is a hallucinogen is because this belief would frighteningly differentiate it from the other “drugs” that are already legal and commonly used, like alcohol, nicotine, and caffeine. The agenda is to suppress kratom by saying and doing whatever is necessary, so that it can be stopped before the public begins demanding its rights, as Americans once did to make alcohol legal again. If herbs like kratom were to become controlled through transparent regulatory means, then we would have the power to effect changes in the policies, such as is already happening with cannabis legalization in state after state. So they plan to stop it before there is any public debate. There have been no legal actions against opium lettuce, because the same compounds occur in farmed lettuce too, though to a lesser degree. Outlawing lettuce is simply not feasible for them, so they must ignore it while hoping that we do not notice. Taking action against lettuce would only expose the agenda. Lawmakers are usually quick to jump onto the bandwagon of banning various substances, to seem “tough on drugs”. Most of the legislative bills that ban herbs are ironically intended to stop the dangerous synthetic drugs, yet within the fine print of the bills is usually found the alternative plants too. When contacted by concerned citizens, lawmakers were typically unaware that they had banned the natural substances. So perhaps our legislators should take the time to read what they vote for, and take into account the fact that corrupt agencies are manipulating our laws through trickery. In the routine fashion, the mainstream media is again kowtowing to its biggest sponsors and the regulators by openly attacking natural painkillers. Take for example that on September 22nd of 2012, Forbes magazine published an article that warned about kratom causing “vomiting, delusions and hallucinations”. This was patently untrue, with the possible exception of vomiting, which can result from an overdose. This is actually a desirable trait from a safety standpoint. Would it not be wonderful if the doctor-prescribed poisons caused victims to vomit before the dosage became fatal? Again, this shows the difference between man’s drugs and God’s medicine. The media circus has been claiming that kratom is addictive, and it has justified these reports by using the shoddy science that was referenced earlier. For example, they mention that mice repeatedly consume kratom whenever they are exposed to it, but this does not actually prove that kratom is addictive, but only that it is desirable. We could likewise argue that cheese and corn are addictive to mice using this same logic, since mice also choose to consume them again and again. Since human subjects can report that they have not suffered from any addiction withdrawals, the testing was moved onto animals, where the desired test results could not be disproven. This increasingly common type of scientific fraud is something that we call “data shopping”, but most of society calls it “creative accounting”. For now, we should all be afraid of corn, cheese, and of course, kratom addictions. There are very few organizations that are fighting for our right to have access to natural medicines. The few organizations that exist are disorganized, and they typically only focus on a single herb. None are Christian, which is especially disturbing, for we Christians should feel the call of duty. To be truly effective, a group needs to fight for our right to have access to all of the God-given medicines. This issue spans much wider than a single plant. It is about our basic right to use the much safer medicines that were provided by God, and which do not require us to insult him through sorcery. It may help our American readers to put the tyrannical situation into perspective by learning that our Constitution and Bill of Rights were written on hemp paper (also outlawed), that Benjamin Franklin was the man who smuggled the national treasures of cannabis and hemp into the United States, and that Thomas Jefferson compassionately grew opium poppies on his plantation for those in need. Our Founding Fathers would have been hunted criminals by the F.D.A. and D.E.A., if these organizations had existed during their time. Our Founding Fathers would be deeply ashamed to witness what we have allowed to happen, and how we have apathetically squandered the greatest inheritance that any people ever had. Nevertheless, we believe that truth, liberty, and justice may once again rise, even in the United States. It is crucial for people to be able to successfully treat their own pain. We should not be forced to endure pain unless we submit to the whims of our medical keepers and regulatory cronies. Moreover, the natural painkillers are always better than the pharmaceutical drugs, because they are never addictive, nor do they induce liver damage. We are seeking volunteers who have the time to join us in ensuring that these plants remain available. In some cases, such as when bills are being considered, the solution could be as simple as contacting representatives, in order to let them know what they are really voting for. Those who believe that our health, the truth, and freedom are worth fighting for should contact us. We need to put together a team, and maybe you are the person that we are looking for. For everyone’s future, we need a few good troublemakers. There is a position awaiting you on the Health Wyze team, so we hope that you are ready to answer our call, literally. I’m interested in more information. I am strongly against synthetic pain medications being handed out like candy. I have lost friends and loved ones due to the ignorance of their Doctor prescribing medications that should not be mixed together and die in their sleep. Xanax and Methadone. To much of a good thing isn’t really so good. Its all about money to the Pharmaceutical Industry, how sad for people to suffer for their greed. It is really great to read such an honest, truthful and thought provoking article. People need to wake up and see what our government is doing to its citizens. I have been suffering from intense chronic pain for over 15 years caused by degenerative disc disease and a muscle/autoimmune disease. Agood day for me is a 7 on the pain scale. I took pain meds for over 10 years. When I became too sick to work and lost my insurance, in the eyes of the medical community I became a drug seeker and someone who was not to be believed. I can’t even find a doctor now, let alone pain medication. So my only option is to suffer terribly and try to find a way to help myself by using alternative medicine. I get that there are people out there that abuse drugs. But that makes life almost impossible for people who really need it. I don’t think it’s right that anyone should have to suffer the way I do. I would like to see it change. So thank you for speaking out about Such a sensitive issue, I hope somehow it changes before long because some days I don’t know how much more I can take.